Help us to identify the best IT blogs in the UK by voting for your favourite in the IT Security category. In the IT Security category we were looking for our readers' pick of blogs about security issues from malware to usage policies and risk assessment. 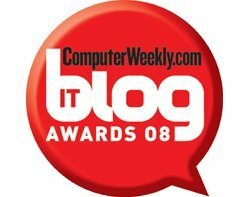 All the blogs listed were nominated by Computer Weekly readers, whittled down to a final shortlist by our judges, and then put back to our readers for the final vote to select the winner and runner-up. See also: ComputerWeekly.com IT Blog Awards 2008 Winners - All categories.